Al Tareq Al Ameri, cheif executive officer, Yas Marinia Circuit explains to Breaking Travel News why an F1 racing car is on display at the Arabian Hotel Investment Conference. Talking to Phil Blizzard he looks at the business and leisure aspects of the Yas Marina Circuit from a MICE perspective, and also talks about their ‘jewel in their crown’ - The Formula 1 Etihad Abu Dhabi Grand Prix. 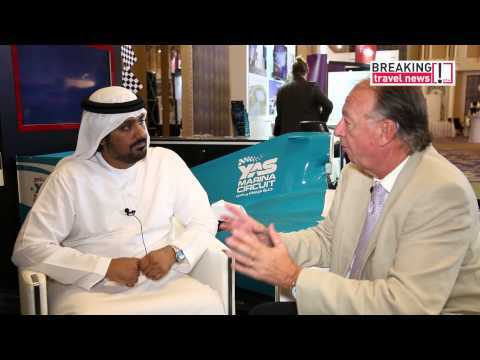 Phil Blizzard here catches up with Al Tareq Al Ameri, chief executive of Yas Marina Circuit, Abu Dhabi, to discuss the enhancements the destination are introducing for the 2014 F1 Etihad Airways Abu Dhabi Grand Prix. He also talks about what it means to the UAE capital to, once again, host the final race on the calendar and about the possible impact of the newly introduced double points for that final race. 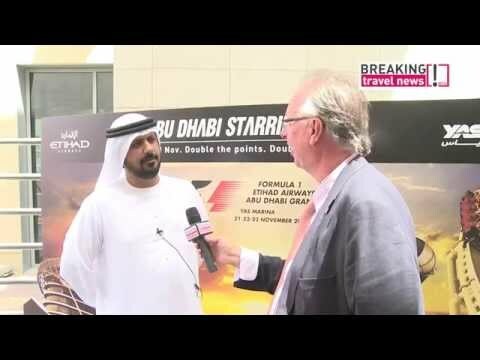 Travel Talk’s Phil Blizzard here catches up with Al Tareq Al Ameri, chief executive of Yas Marina Circuit, Abu Dhabi, to discuss the enhancements the destination are introducing for the 2014 F1 Etihad Airways Abu Dhabi Grand Prix. He also talks about what it means to the UAE capital to, once again, host the final race on the calendar and about the possible impact of the newly introduced double points for that final race. Yas Marina - one of the premier marinas in Abu Dhabi, and operated by Camper & Nicholsons Marinas - has teamed up with the Emirates Wildlife Society in association with WWF to become a turtle adoption pack distributor as part of the Marine Turtle Conservation Project. Yas Marina will adopt a turtle on behalf of each annual berth holder and 2012 Etihad Airways Abu Dhabi Grand Prix berth holder. Abu Dhabi has been named as the host destination for the 13th WTTC Global Summit, which will bring hundreds of international travel and tourism leaders to the UAE capital next year. This is the latest coup for the emirate, which beat all records and targets for guest arrivals in 2011. Breaking Travel News takes a look at some of the exciting developments on the horizon as Abu Dhabi moves into the spotlight. The Abu Dhabi Tourism & Culture Authority has confirmed will offer one lucky winner each day a free ticket to the Etihad Airways-sponsored Abu Dhabi Formula 1 Grand Prix later this year. The event runs from April 30th to May 3rd at the Dubai International Convention Centre, with the race taking place in November. Abu Dhabi’s premier marina, Yas Marina has signed a partnership agreement with Dubai-based seaplane tour operator Seawings to begin routes to Yas Marina and Yas Island with immediate effect. The move will enable Dubai’s tourists and residents to enjoy Yas Marina’s offerings.